Amphidonax bifaria Nees ex Steud. Donax bifarius (Retz.) Trin. ex Spreng. 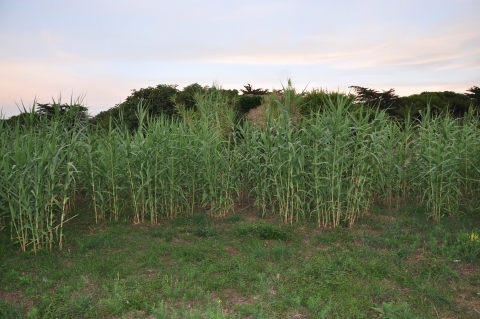 Giant reed is a large, clump-forming, bamboo-like, perennial grass with elongated rhizomes. It produces erect, more or less woody, thin-walled stems 200 - 600cm tall. Arabian Peninsula through western and central Asia to China, Japan, India, Myanmar to Malaysia and Indonesia. Widely naturalized elsewhere. Plants rarely if ever flower in British gardens233]. ]. When large enough to handle, prick the seedlings out into individual pots and grow them on until they are 20cm or more tall then plant them out into their permanent positions. ]. Whilst large divisions can be planted out direct into their permanent positions, we have found that it is best to pot the divisions and grow them on until they are rooting away well.